It may be semi-desert, or covered with grass or shrubs or both, depending on the season and latitude. It is the sort of climate that is in regions too dry for a forest, but not so dry that there are only deserts. The soil is too moist for a desert, but too dry for normal forest life. Steppes receive slightly more rain than deserts do. This is an open area, and often there were long distances between places with good water. People who lived in this type of area were often nomads, often traveling by horses. Genghis Khan was a great warrior from Mongolia who lived on the steppe. In the United States, the cowboy herded cattle in the steppe, moving from place to place by horse. During the Dust Bowl in the 1930's in North America, farmers who had recently settled on the land and started farms suddenly found themselves without food. Many of them left. Eventually they learned to plow differently and plant crops that survived a drought better, and to plant trees in rows called windbreaks. ↑ "steppe in Learner's Dictionary". Merriam-Webster. 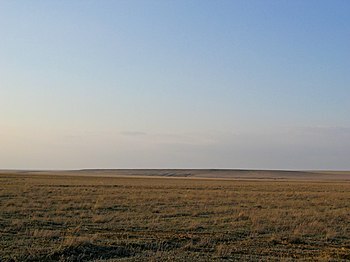 http://www.learnersdictionary.com/search/steppe. Retrieved 8 April 2013. ↑ 2.0 2.1 "Definition of Steppe". National Geographic. http://education.nationalgeographic.com/education/encyclopedia/steppe/?ar_a=1. Retrieved 8 April 2013. This page was last changed on 4 November 2013, at 04:40.